1. 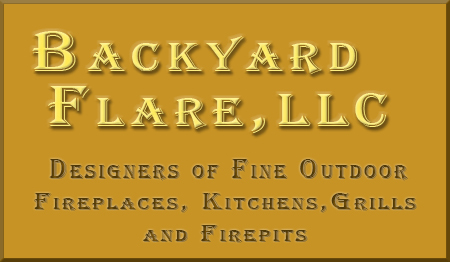 Backyard Flare provides a great service at an even better price. Other websites were considerably higher priced for similar designs. Also, Dan was there for me every step of the way as he customized the design I chose. His plans were easy to follow and it only took me nine days from start to finish. I can't say enough good things about their product and service. Matt in Wisconsin. 2. Dan, I just wanted to let you know I finally completed the outdoor fireplace (Santa Cruz) that you sent me. I was so impressed with the fine detail of the plans. They were so easy to follow and every fine detail was included, so easy that anyone could do it. I also wanted to thank you for working with me on the plans. When I first contacted you, and told you what I needed, it was only a few days until you contacted me with the plans fit for what I needed. Daryl in Texas. 3. Dan's plans are clear and easy to follow. Plus he is there for you from start to finish with tech support and encouragement. A-plus. Janie and Larry in Texas. 4. I'm very grateful for having found your site. Building the fireplace myself, even including the cost of the gas logs (roughly $650), will end up saving me approximately $4000 based on 3 different estimates I received from professional landscapers! Adrian in Texas. 5. Your plans were AMAZING!!! There was no guessing with your plans. It was perfect and made building it quick and easy. Brian in Florida. 6. The plans gave me the confidence to build my fireplace, something I never thought I would even try. Thanks. John in California. Cheapest cost I had for me to sub the job out was $3656. Thanks Dan!!!! (Taken from Facebook) Chuck in Louisiana.